Marine researchers were hoping that 2016 was going to be a better year for whales in Alaska. “We were kind of thinking it was over and just these last couple of weeks things have really picked up,” said Kathy Burek, a veterinary pathologist who does post-mortems on dead whales. She’s been very busy this past year. In 2015, 45 large whales were found dead in the Gulf of Alaska alone—more than five times higher than average for the last five years. A spike this big is called an Unusual Mortality Event, or UME, and NOAA’s National Marine Fisheries Service works with researchers like Burek to determine the cause. Getting to the bottom of the mystery is proving difficult, in part because it looks like the wave of deaths may not be over. Nearly 20 whales have been found dead in the region this year. We reported last week that three were found in the last two weeks of June. Another humpback was reported dead near Sitka July 5. Investigators try to learn as much as they can about each dead whale. But Burek says getting tissue samples is tricky. They also have to deal with hungry bears beating them to carcasses, and extreme tides that can wash the whales away. So there’s a dearth of data for NOAA’s team of experts to analyze to try to figure out what caused all those deaths. They’ve had better luck getting samples from some of the whales that have died this year. But it’s not clear if this year’s deaths are related to last year’s, or if it’s a new problem altogether. So do we know anything at this point about what’s been killing whales? Sort of. The best hypothesis right now is that the UME is related to the increase in harmful algal bloom toxins—specifically, domoic acid and saxitoxin. They’re produced by certain species of algae, which are showing up in higher concentrations in northern waters in recent years. In 2015, unusually warm waters contributed to a record algae bloom in the Pacific that produced a lot of domoic acid, which has been linked to sea lion and bird die-offs. But Burek said these toxins are probably not directly responsible for the whale deaths. It’s more complicated than that. 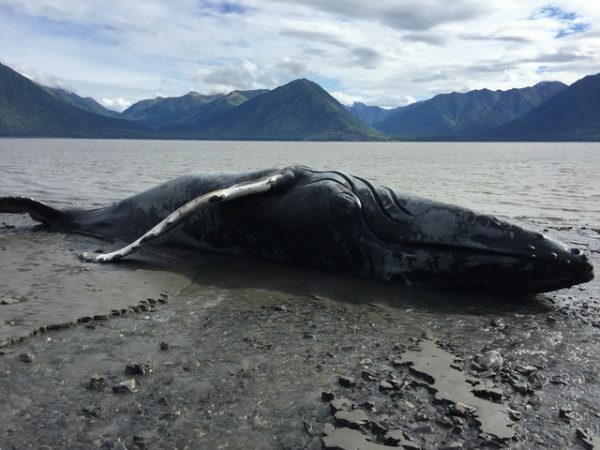 Burek says we’ll have to wait at least a few more months before we know more about the possible cause of death of whales in Alaska waters this year. And the bigger questions of how a changing ocean ecosystem is contributing to these die offs are even harder to answer.